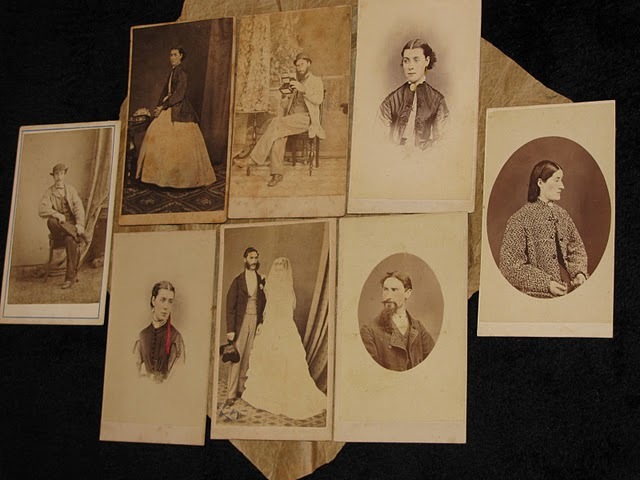 This selection of studio portraits taken by Thomas J. Nevin in the early 1870s of otherwise unidentified older women includes just one whose name is inscribed verso: Mrs Morrison. Who might she have been? 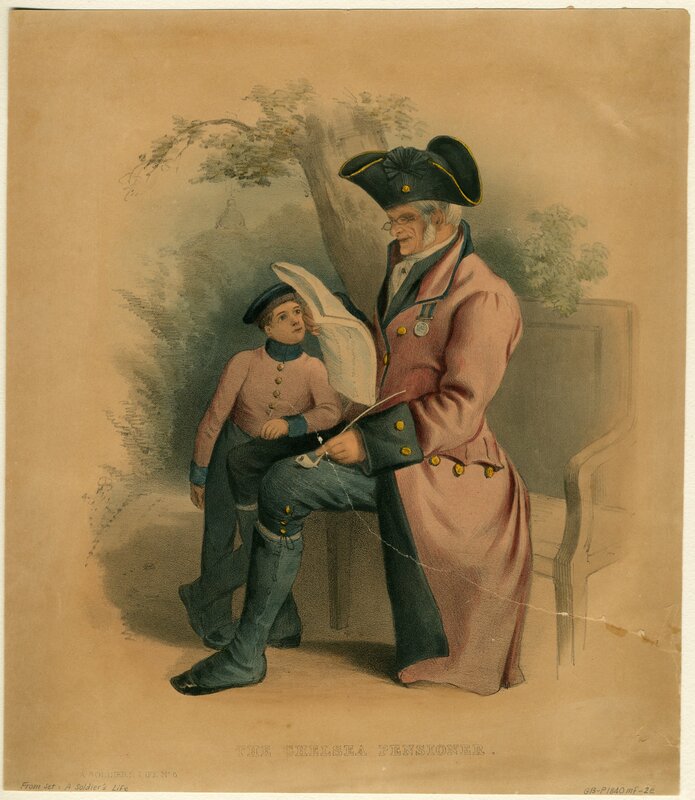 A servant, a farmer, a post-mistress, some relation to Askin Morrison, ship owner, of Morrison Street, opposite Franklin Wharf, Hobart? Or Mrs Morrison, teacher of Kangaroo Point whose health had forced her to retire (Mercury, 6 December 1872). Perhaps she was Mrs Ellen Morrison, licensee of the Launceston Hotel, Brisbane St. on a visit south to Hobart? Whoever this sitter was, she appears to have worked hard all her life, no fuss or frills about it. 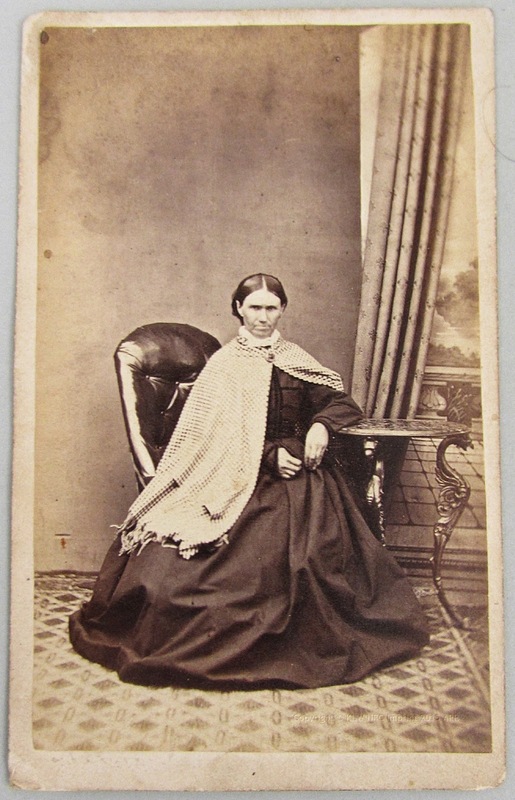 Full length cdv on plain mount: Mrs Morrison (name inscribed verso) wore a three-quarter length, light-coloured, thick check-weave shawl pinned at the neck with a brooch over a white scarf for this important occasion. Her dark dress shows braiding in rows on the bodice and cuffs. She had pinned a thin plait over her head at the back. Her scowling stare straight at the camera under thunderous eyebrows might suggest excitement at having her likeness taken, a rare event perhaps and possibly an expensive one, or fascination with process, or simply impatience with the ever affable, rather humorous, and good-looking thirty-ish Mr. Nevin. STUDIO DECOR: Mrs Morrison sat on Nevin’s low chair covered with shiny material, her left arm resting on his table with the griffin-shaped legs. Noticeably absent from the table is any decoration, such as a vase or book, which just might indicate that Nevin charged a little extra for flowers which his assistant would then hand-tint, but the client declined the offer. Or perhaps it was winter when flowers were not available. Behind the table hangs the backdrop sheet painted with the usual vista of tiles on a patio terrace, an Italianate balcony, and a river meandering through a valley in the distance, partially obscured by the drape.The carpet pattern of lozenges and chain links features in some but not all of these full-length portraits. Studio portrait by Thomas Nevin ca. 1870-1875. 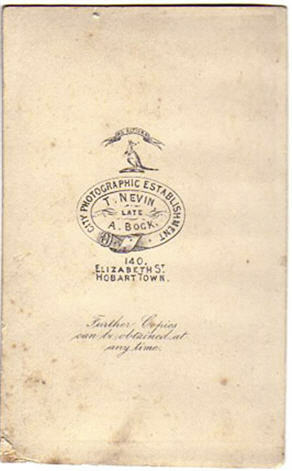 Verso inscribed “Mrs Morrison” in black ink with studio stamp: “Ad Altiora” above Kangaroo emblem, T. Nevin late A. Bock encircled by belt printed with “City Photographic Establishment” and address below, “140 Elizabeth St. Hobart Town”. In italics below: “Further Copies can be obtained at any time”. 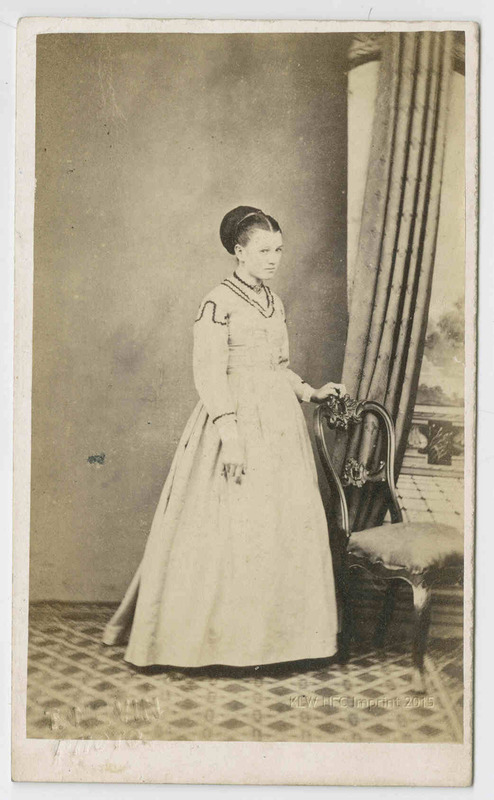 Verso: Full length cdv on plain mount : Mrs Morrison (name inscribed verso) wore a three-quarter length, light-coloured, thick check-weave shawl pinned at the neck with a brooch over a white scarf for this important occasion. Her dark dress shows braiding in rows on the bodice and cuffs. She had pinned a thin plait over her head at the back. Her scowling stare straight at the camera under thunderous eyebrows might suggest excitement at having her likeness taken, a rare event perhaps and possibly an expensive one, or fascination with process, or simply impatience with the ever affable, rather humorous, and good-looking thirty-ish Mr. Nevin. STUDIO DECOR: Mrs Morrison sat on Nevin’s low chair covered with shiny material, her left arm resting on his table with the griffin-shaped legs. Noticeably absent from the table is any decoration, such as a vase or book, which just might indicate that Nevin charged a little extra for flowers which his assistant would then hand-tint, but the client declined the offer. Or perhaps it was winter when flowers were not available. Behind the table hangs the backdrop sheet painted with the usual vista of tiles on a patio terrace, an Italianate balcony, and a river meandering through a valley in the distance, partially obscured by the drape. The carpet pattern of lozenges and chain links features in some but not all of these full-length portraits. Full length cdv on plain mount: A mature woman [unidentified] wearing a short thick jacket with six metallic buttons over a dark dress buttoned up from the hem, a flat hat decorated with a large floral arrangement, and a brooch on a dark ribbon at her throat. She decided to keep her outdoor possessions in view for the capture, her closed umbrella and handbag held tight in gloved hands. She sat on Nevin’s low chair covered with a shiny material, her left arm resting on the table with the griffin-shaped legs. No flowers or books were placed on the table, perhaps not to obscure the painted wall hanging behind with Italianate tiling and balcony giving onto a river scene which is very clear in this photograph. The drape is on the viewer’s left, whereas in others, the drape is on the right in front of the wall hanging. This sitter ponders the experience by directing her frontal gaze slightly to the left of the camera, her lips pressed together and cheeks puffed out as though holding her breath. Scans courtesy © The Private Collection of Marcel Safier 2005 ARR. 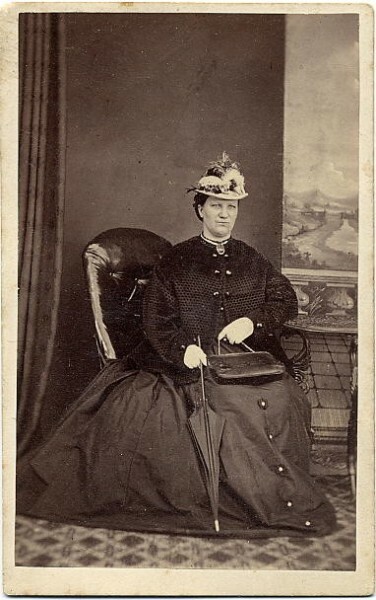 Verso: Full length cdv on plain mount: A mature woman [unidentified] wearing a short thick jacket with six metallic buttons over a dark dress buttoned up from the hem, a flat hat decorated with a large floral arrangement, and a brooch on a dark ribbon at her throat. She decided to keep her outdoor possessions in view for the capture, her closed umbrella and handbag held tight in gloved hands. She sat on Nevin’s low chair covered with a shiny material, her left arm resting on the table with the griffin-shaped legs. No flowers or books were placed on the table, perhaps not to obscure the painted wall hanging behind with Italianate tiling and balcony giving onto a river scene which is very clear in this photograph . The drape is on the viewer’s left, whereas in others, the drape is on the right in front of the wall hanging. This sitter ponders the experience by directing her frontal gaze slightly to the left of the camera, her lips pressed together and cheeks puffed out as though holding her breath. 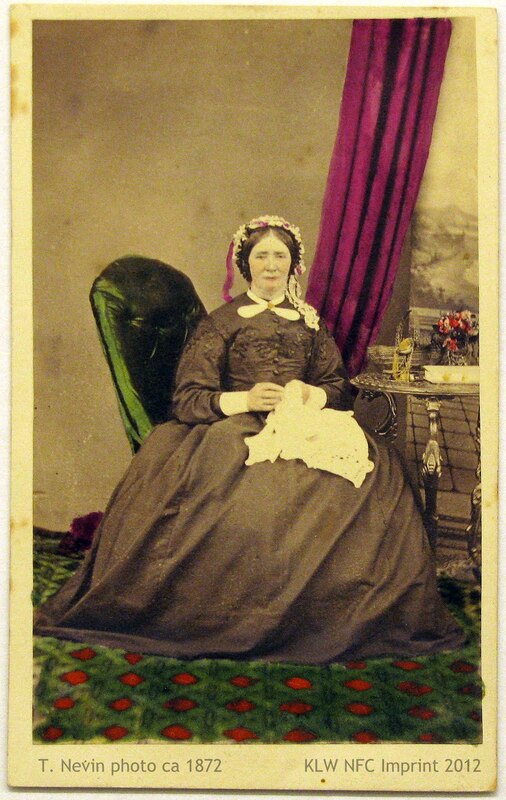 Full length and highly-coloured cdv on plain mount: A mature woman [unidentified but possibly Emily Giblin nee Perkins, wife of Thomas Nevin’s family solicitor, the Hon. W.R. Giblin, Attorney-General] wearing a white floral head covering with ribbons, a plain dress with white bow and white cuffs, seated with sewing on Nevin’s low chair covered with shiny material at his table with the griffin-shaped legs on which stands a portable pin cushion, books, and vase with flowers, all highly colored including the carpet and drape. Only the backdrop of a patterned patio looking out from an Italianate terrace to a vista of a meandering river has escaped the colouring. 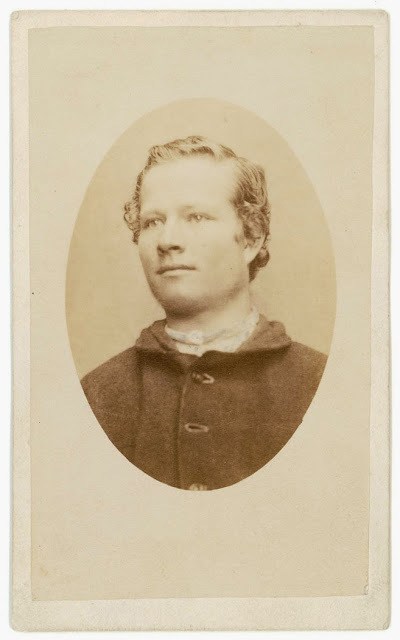 This carte-de-visite ca. 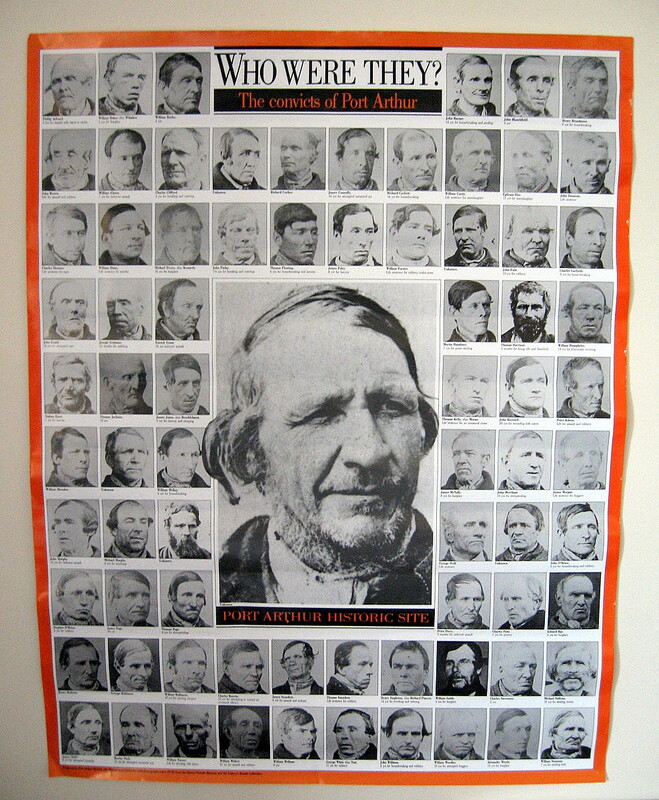 1872 taken by T.Nevin late A.Bock, 140 Elizabeth St., Hobart Town may have been coloured by the purchaser, whether the client, or the client’s descendants. Similar inept or heavy-handed colouring is evident on a private collection of Nevin’s studios portraits originating from a family in northern Tasmania, and another held at the QVMAG, Launceston. 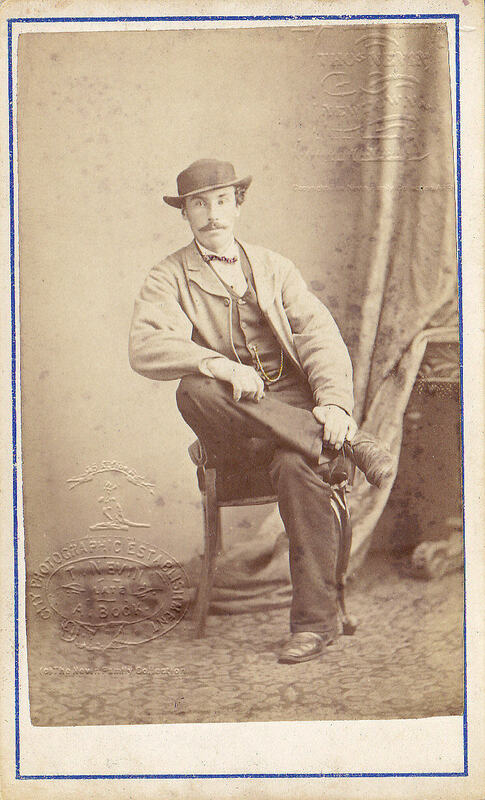 This item is held at the Archives Office of Tasmania, Hobart, included in a box with Thomas Nevin’s carte-de-visite of W. R. Giblin. 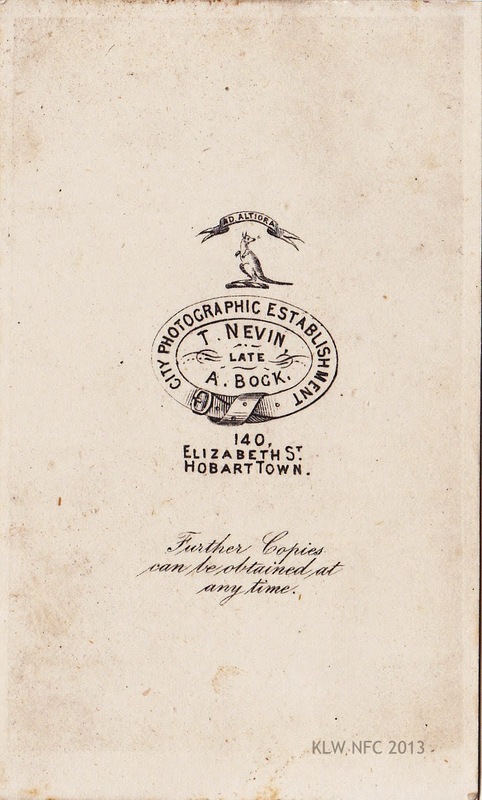 Verso with studio stamp: “Ad Altiora” above Kangaroo emblem, T. Nevin late A. Bock encircled by belt printed with “City Photographic Establishment” and address below, “140 Elizabeth St. Hobart Town”. In italics below: “Further Copies can be obtained at any time”. 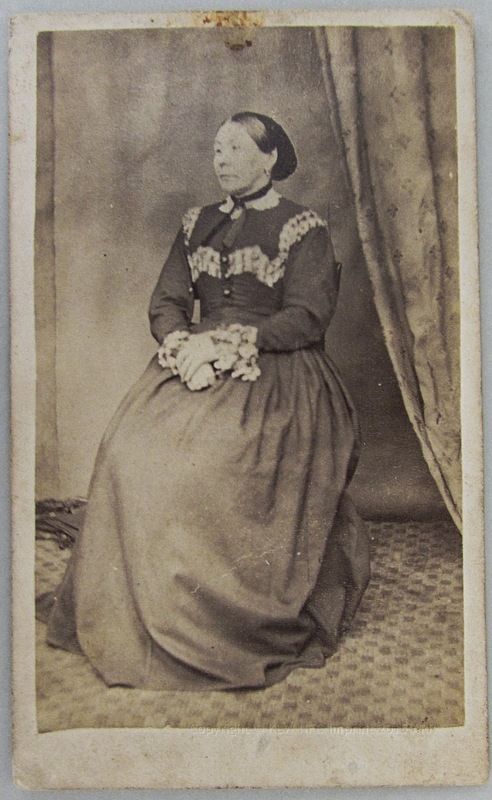 Verso: Full length and highly-coloured cdv on plain mount: A mature woman [unidentified but possibly Emily Giblin nee Perkins, wife of Thomas Nevin’s family solicitor, the Hon. W.R. Giblin, Attorney-General] wearing a white floral head covering with ribbons, a plain dress with white bow and white cuffs, seated with sewing on Nevin’s low chair covered with shiny material at his table with the griffin-shaped legs on which stands a portable pin cushion, books, and vase with flowers, all highly colored including the carpet and drape. Only the backdrop of a patterned patio looking out from an Italianate terrace to a vista of a meandering river has escaped the colouring. 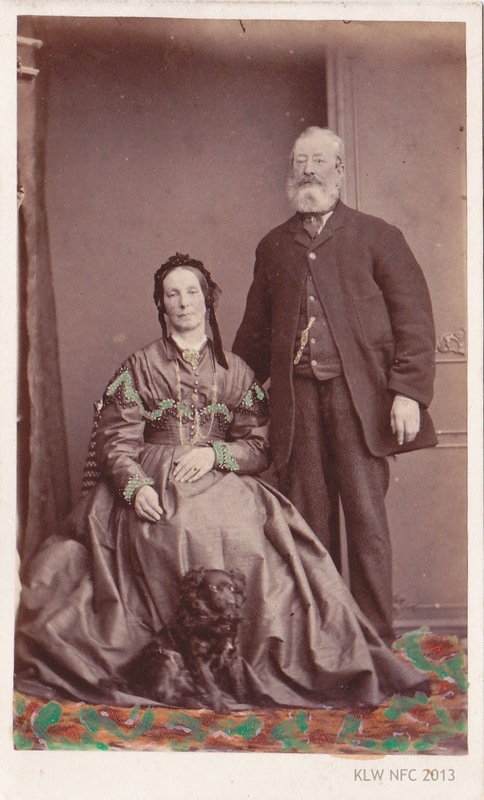 This carte-de-visite ca. 1872 taken by T.Nevin late A.Bock, 140 Elizabeth St., Hobart Town may have been coloured by the purchaser, whether the client, or the client’s descendants. Similar inept or heavy-handed colouring is evident on a private collection of Nevin’s studios portraits originating from a family in northern Tasmania and another held at the QVMAG, Launceston. 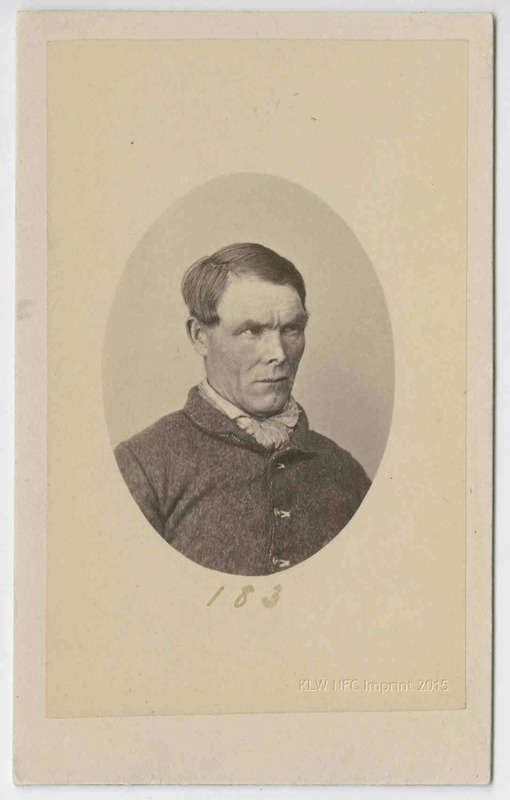 This item is held at the Archives Office of Tasmania, Hobart, included in a box with Thomas Nevin’s carte-de-visite of W. R. Giblin. 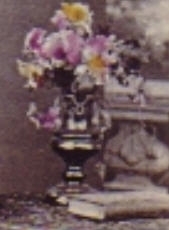 Full length cdv on plain mount: An older woman [unidentified] seated on Nevin’s low chair covered with shiny material, her left elbow resting on the studio table with the griffin-shaped legs where a book and a dark vase holding delicately tinted flowers in pink and yellow have been arranged. The drape is to the viewer’s left in this photograph. This woman wore a very long dark plain dress showing a fold near the hem, with braiding around the drop shoulders and a brooch on a ribbon at her throat, her hair plainly arranged at the nape. Perhaps she was newly widowed. Her eyes are sunken and her forlorn gaze averted, directed towards the foot of the camera stand rather than at the lens. 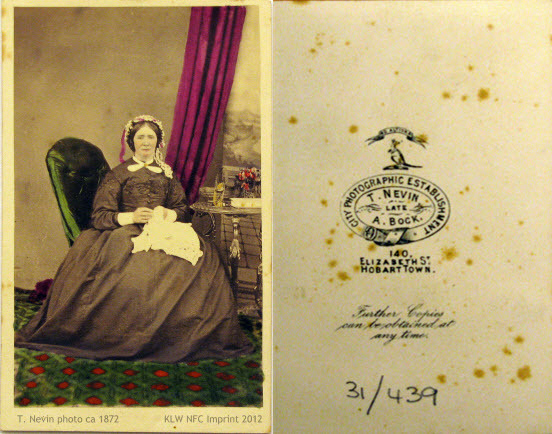 Verso: Full length cdv on plain mount: An older woman [unidentified] seated on Nevin’s low chair covered with shiny material, her left elbow resting on the studio table with the griffin-shaped legs where a book and a dark vase holding delicately tinted flowers in pink and yellow have been arranged. The drape is to the viewer’s left in this photograph. This woman wore a very long dark plain dress showing a fold near the hem, with braiding around the drop shoulders and a brooch on a ribbon at her throat, her hair plainly arranged at the nape. Perhaps she was newly widowed. Her eyes are sunken and her forlorn gaze averted, directed towards the foot of the camera stand rather than at the lens. 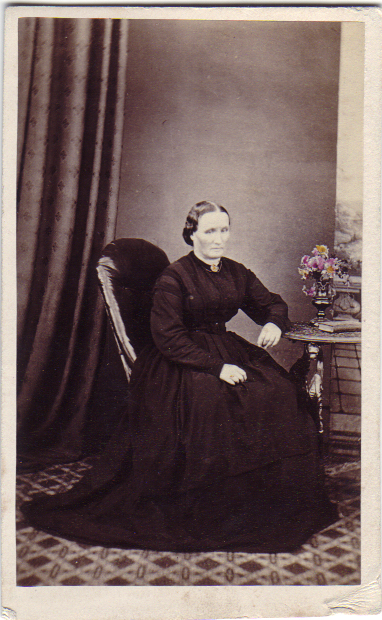 Full length cdv on plain mount: An older woman [unidentified], possibly of East Asian origin, with small earrings and a black ribbon tied at the neck, her dress buttoned at the bodice and trimmed at the bust line, neck, shoulders and cuffs with thick white lace. She was photographed sitting on a high stool in semi-profile, eyes turned to the viewer’s left, hands folded, with the drape on the viewer’s right, in an otherwise bare studio. No table, no flowers, no back sheet, no low chair, only something flat and folded on the floor at left where the edge of the plain back sheet is visible. 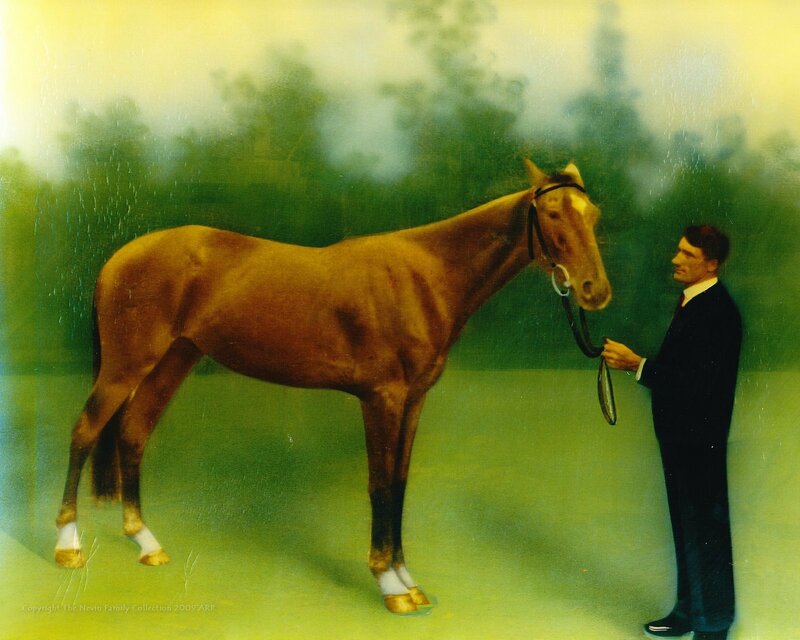 The original print by Nevin may have been pasted into an oval mount, which would have reduced the image and made any studio decor unnecessary at the time of capture, but when Clifford made a copy for this client from Nevin’s negative, he may have been unaware of the original mount. 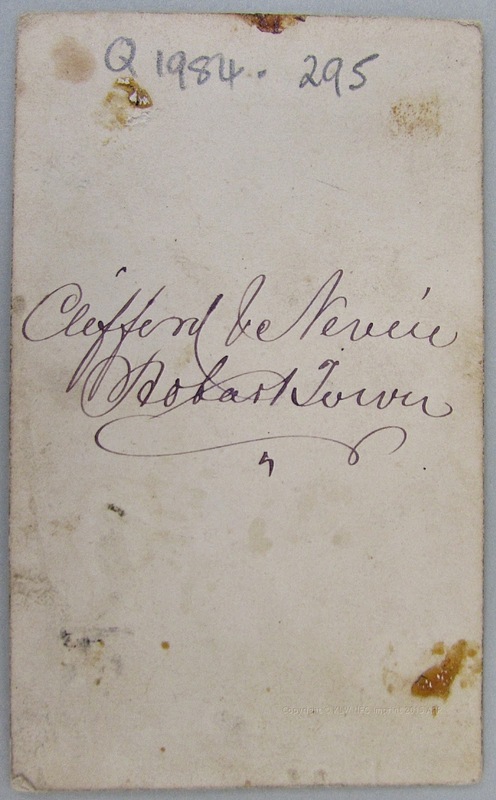 Several extant prints inscribed verso with “Clifford & Nevin Hobart Town” which were reproduced from Nevin’s negatives show a similar lack of studio furniture. 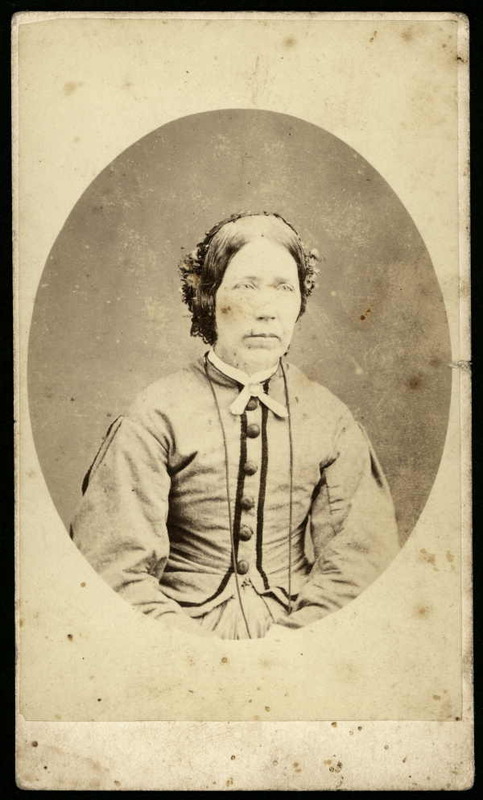 Verso: Full length cdv on plain mount : An older woman [unidentified], possibly of East Asian origin, with small earrings and a black ribbon tied at the neck, her dress buttoned at the bodice and trimmed at the bust line, neck, shoulders and cuffs with thick white lace. She was photographed sitting on a high stool in semi-profile, eyes turned to the viewer’s left, hands folded, with the drape on the viewer’s right, in an otherwise bare studio. No table, no flowers, no back sheet, no low chair, only something flat and folded on the floor at left where the edge of the back sheet is visible. Oval frame, head and torso to below waist cdv on plain mount: An older woman [unidentified] wearing a floral head band, a light-coloured dress, or perhaps a skirt and matching jacket trimmed in dark braid with large buttons and wide sleeves dropped from the shoulder, a white bow at her neck and a thin long chain reaching below her waist. Her gaze is serious, calm, and directed 25 degrees or so off centre towards the viewer’s right. [Studio portrait of a woman, half-length, to left] T. Nevin. Creator: Nevin, Thomas J., photographer. Title:[Studio portrait of a woman, half-length, to left] [picture] / T. Nevin. 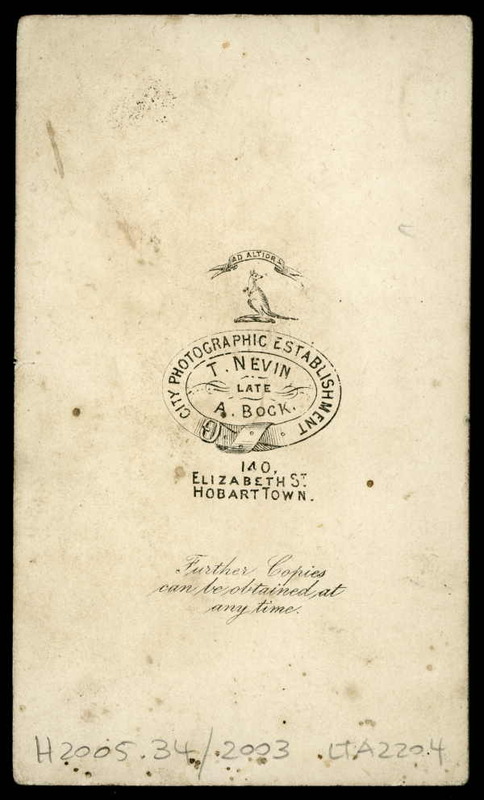 Not dated but Nevin worked at 140 Elizabeth Street, Hobart Town, between 1867-1875. Ref. : Australians behind the camera, directory of early Australian photographers, 1841-1945 / Sandy Barrie, 2002. 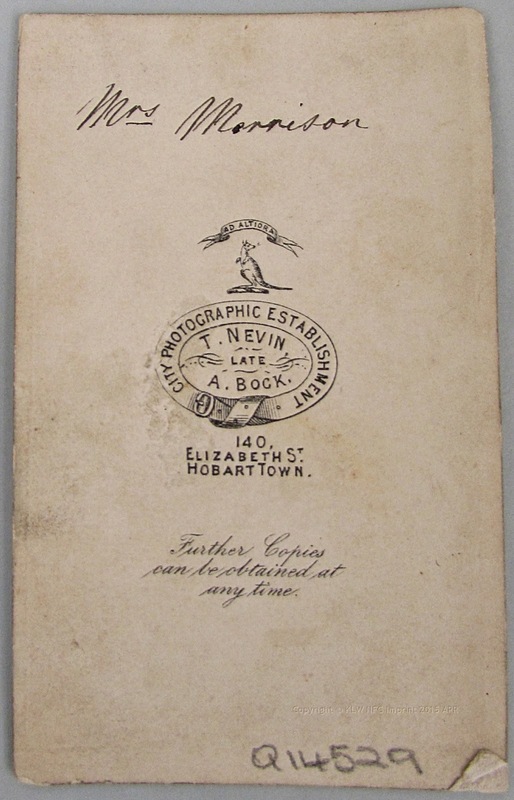 Photographer printed on verso: City Photographic Establishment / T. Nevin / late / A. Bock / 140 / Elizabeth St. / Hobart Town. 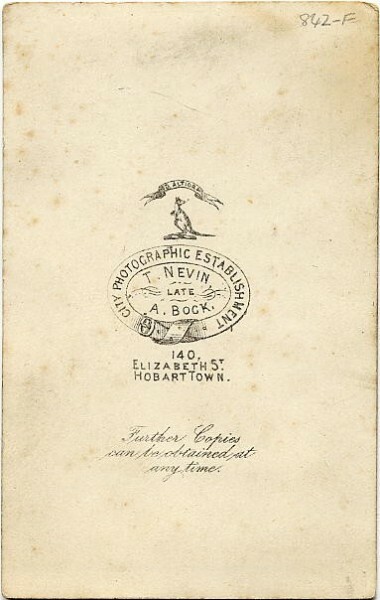 Verso with black studio stamp: “Ad Altiora” above Kangaroo emblem, T. Nevin late A. Bock encircled by belt printed with “City Photographic Establishment” and address below, “140 Elizabeth St. Hobart Town”. In italics below: “Further Copies can be obtained at any time”.